Most restaurants try to entice clientele in with their street presence, framed menus, and greeters at the door. The Safe House is different. The goal here is to remain as inconspicuous as possible. In fact, there's not even a sign outside, nor any welcoming windows to peer in to see diners enjoying their experience. 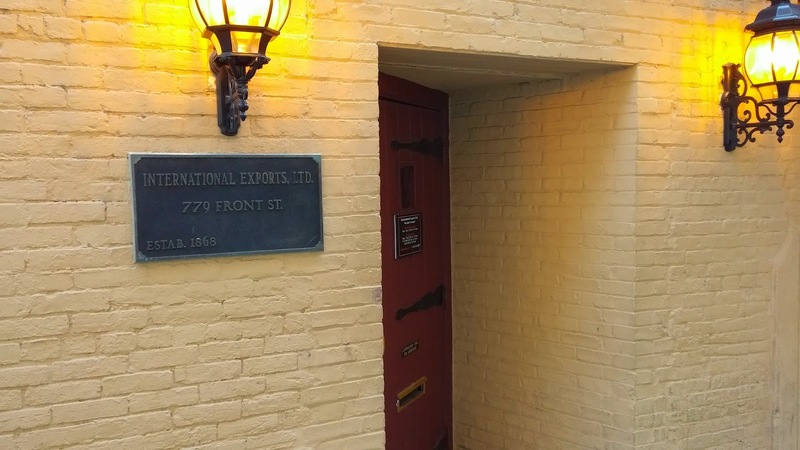 Instead, it's a wooden door with a metal placard beside it that says "International Exports, Ltd." No one would know, walking down the street, that a restaurant and bar is inside. This place has probably the most secret French Dip in existence. 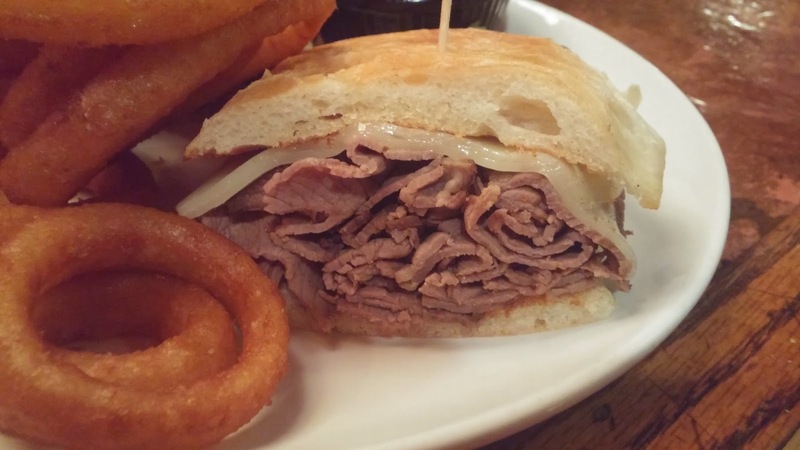 "...probably the most secret French Dip in existence." This CAN'T be a restaurant, can it? 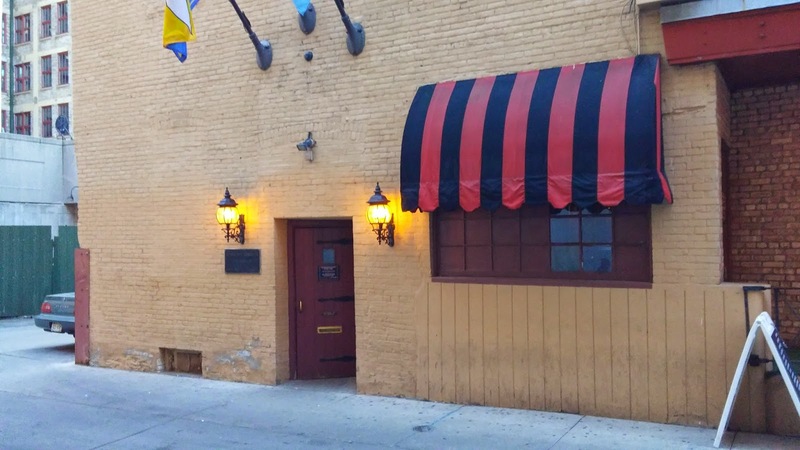 "It's a Milwaukee institution that locals enjoy taking out-of-towners for a bar experience like no other." The Safe House is basically a speakeasy. 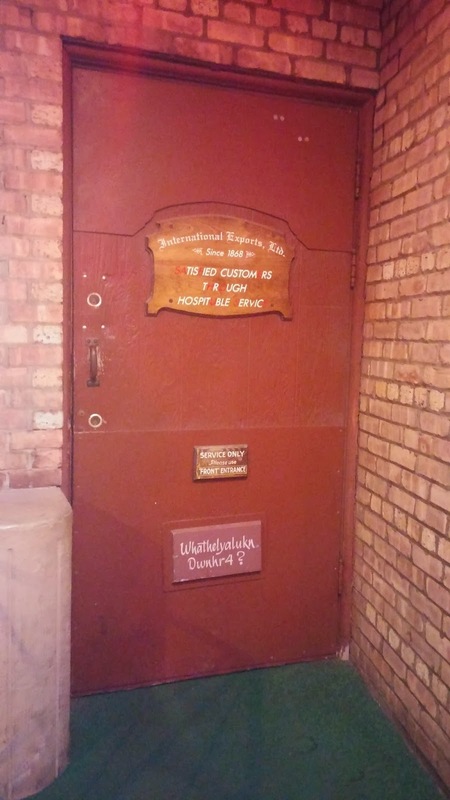 But rather than a prohibition theme, The Safe House goes for a spy theme. You enter, and are greeted by a receptionist who asks you to stand against the wall. She'll ask you if you know the password. And if you know it, don't say it aloud - just whisper it into her ear when she asks. If you don't know it, then expect to be asked to perform a few tasks to be let in - this could be whatever she wants. My task the first time I came to this place was to make muscle poses (with my toothpick arms). Luckily, I was in the know on my second visit, and didn't have to make a fool of myself prior to entering (and no, I'm not telling anyone the password - nor should you if you find out). After you've given the password or completed your tasks, a bookshelf door will open and you'll be sent up the stairs, and into a hallway which ends at...a full wall mirror. Where do you go now? Just wait a few seconds and the doors will open to let you in the place. Inside, the place is actually bustling. It's a Milwaukee institution that locals enjoy taking out-of-towners for a bar experience like no other. So now that I'm in, on to the food. If you are in Wisconsin, you simply must have deep fried cheese curds. So I had to start out with that. Delicious! But I must admit that it's kind of hard to mess up deep fried cheese curds with marinara for dipping. 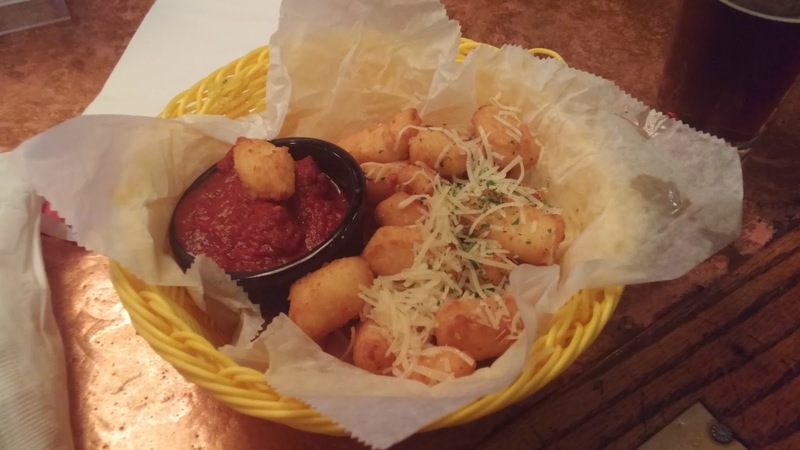 Deep fried cheese curds and marinara. 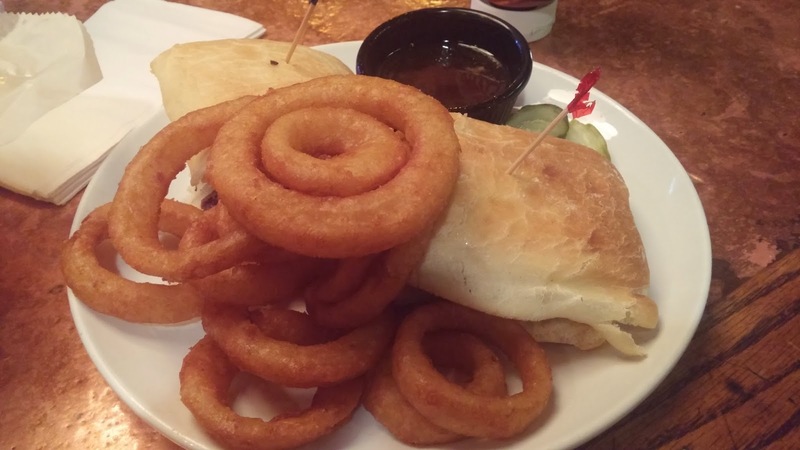 I ordered "Ze French Dip," as the menu calls it, for my entree, with a side of onion rings. There are 7 or 8 sides to choose from - After eating the cheese curds, I figured I should just clog my arteries all at once rather than doing it over a period of time. The sandwich wasn't bad, but it wasn't great either. The sandwich wasn't bad, but it wasn't great either. The bread was somewhat of a rectangular soft ciabatta. That's the only way I know to describe it. The roast beef was plentiful and tasty, with no fat or gristle, but nothing really special. I chose to have the sandwich topped with provolone, but it's up to you to decide on the cheese (if cheese at all). The au jus was the shining point in this dip - good consistency, the right amount of saltiness, the nice beefy flavor...just not enough of it to complete my dip. I got about 2/3 of the way through the sandwich before I went dry. 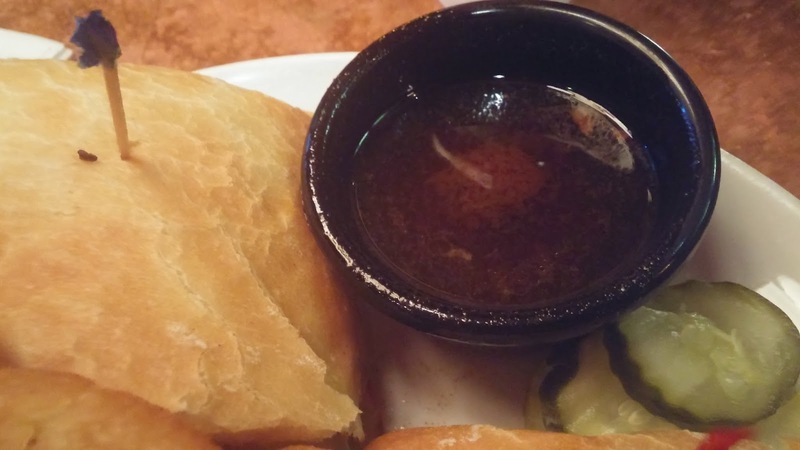 The au jus was the shining point in this dip - good consistency, the right amount of saltiness, the nice beefy flavor. Great au jus...just not quite enough of it. The Safe House is more or less a place you go for an interesting experience, not necessarily renowned cuisine. That being said, my meal in itself certainly left me satisfied, but not wowed. It's a decent French Dip, but the experience of the restaurant/bar itself is the real attraction here.